Traditional solar panels have aluminum frames and are mounted on brackets that do not blend well with the home and building designs and somewhat makes the roof look unattractive. A Residential solar customer wants more sophistication and added aesthetics to his rooftop. 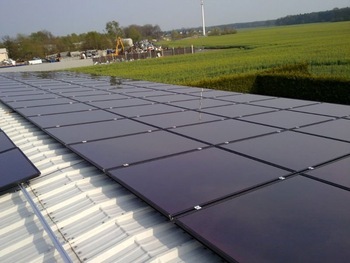 These customers want more attention be given to the look of rooftop panel installation. Frameless solar panels have evolved over time. To add to the aesthetic value of the building, solar engineers first manufactured all black modules. Next came in the frameless panels, after removing the aluminum frame. Today, thinner glass materials are used in manufacturing these frameless modules. The prices have also gone down considerably over the years. They weigh typically between 23-25 kgs. Trina Solar, BYD Solar and Canadian Solar are the largest manufacturers of these panels worldwide. However owing to their weight they are still not very prevalent in the rooftop segment. The solar PV sector and the homeowners are both equally important in the success of the solar panel industry. The solar engineers are always looking to improve the efficiency and productivity of the panels, but are also able to take into consideration the homeowners aesthetic suggestions. This teamwork and mutual respect places the industry in a strong and sustainable position, to keep growing and moving forward and adapting to the need of the hpur on the go. A frameless solar panel has been designed to be aesthetically more pleasing, while still retaining similar efficiency ratings. They are manufactured without aluminum, which results in lower embodied energy. These frames have solar cells arrayed between two layers of glass and hence also called as glass-on-glass panels. These frameless panels bring the array closer to the roof. Since there is no frame to support them, the glass on the panel has to be a little thicker to provide structural integrity to the panel. There are less chances for accidents as they come without metal frames. They are able to blend in better with composition roof shingles, especially with darker shingle colors. Frameless design reduces impact of potential-induced degradation (PID) – enabling longer lifespan. They are able to be mounted without clamps and instead use bolts that go through pre-drilled holes in the glass face. The through-bolt mounting also allows for quick installation. The frameless solar panels do not suffer from problems like corrosion of the frames and are also more durable. These frames can also be used for large scale utility installations because of their low cost component. Inspite of the benefits listed above, framelss solar panels are still not very prevalent. These panels need specific kind of mounting structures to be installed for proper working, which is not very commonly found. Some of the companies manufacturing frameless solar panels are Trina Solar, Canadian Solar, Solarworld, Lumos etc. Lumos also manufactures the mounting structures to be used for these frameless panels. There is a notion in the market that the edges of these panels could be weak since they are not framed. However thick strong glass is used in manufacturing these panels. Generally thin film modules are frameless. Frameless panels still have some technological challenges to overcome. Cost still remains higher than the conventional modules. The market has come to like these panels as is evident with some of the bigger names like Trina and Canadian Solar being involved in this technology. It is finding increased applicability in the agriculture and fishery industry, owing to its higher light transmittance. According to EnergyTrend, these modules will have alrge market in China.